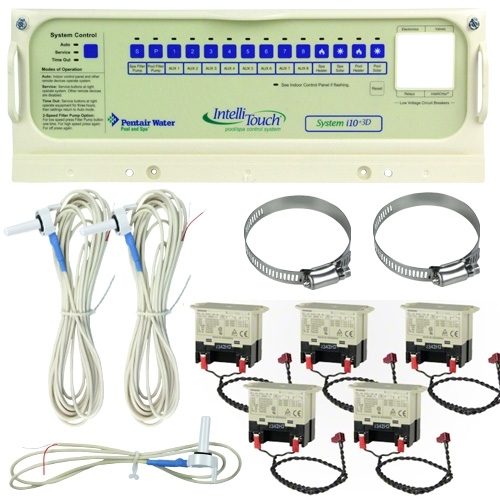 The IntelliTouch i10+3D Personality Kit provides advanced automation for a pool and spa using two separate sets of equipment. An IntelliTouch control system takes the work and worry out of scheduling and operating pool and spa heating, filtration and cleaning cycles. It also gives you one-touch control over additional heaters, valves, pool lights, landscape lights, water features and more. At the same time, IntelliTouch makes sure all your equipment operates at peak efficiency for minimum energy usage and cost. It even helps protect your equipment investment. IntelliTouch senses conditions that could hamper operation and alerts you to these situations or takes automatic corrective action. All IntelliTouch Control Systems can be operated using various Interface Kits, Control Panels, Wired and Wireless remotes, iPhone Application, Screen Logic and even telephone remote control (Interface Kits, remotes and other control interfaces are sold separately). · Pool and spa system for a pool and spa combination using two separate sets of equipment. · Controls 2 Pump/Filtration systems and eight (8) Auxiliary Circuits. · Includes five 3 HP Relays (Load Center or Power Center, purchased separately, includes five 3 HP Relays). · Controls two separate heaters. • IntelliTouch includes a sensor that automatically turns on your pump(s) if freezing conditions are detected. • For those with “pressure-side” cleaners that use a booster pump, an automatic pool cleaner lock-out feature prohibits the pump from operating without a water feed when your system is in spa mode. • IntelliTouch also alerts you to any problems it may be having and tells you when service is needed. Now that’s intelligence…and your ticket to greater pool and spa enjoyment with less work or worry. Now, for all its technical sophistication and range of control capabilities, an IntelliTouch system is very simple to program and use. And that’s what sets it apart from the others. to better match your usage habits, your busy schedule and seasonal changes while assuring good maintenance practices. We designed it to make your life simpler… push-button simple. A basic IntelliTouch system involves just three key elements. Besides making equipment and accessory operation simpler and more convenient, an IntelliTouch system is an investment that can pay you back in other important ways.